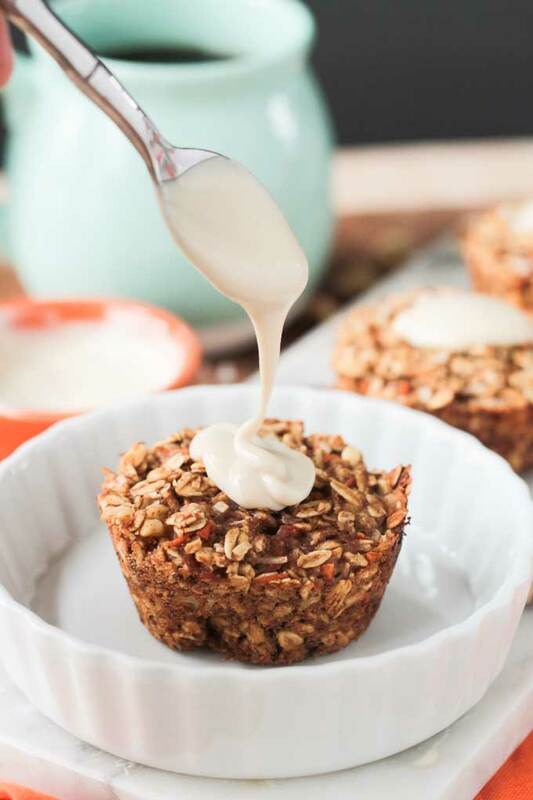 Carrot Cake Baked Oatmeal – sweet, moist and veggie loaded! Tastes just like carrot cake and even has the option of topping it with sweet cashew cream cheese!! It’s time for more baked oatmeal! This time with an Easter holiday theme. 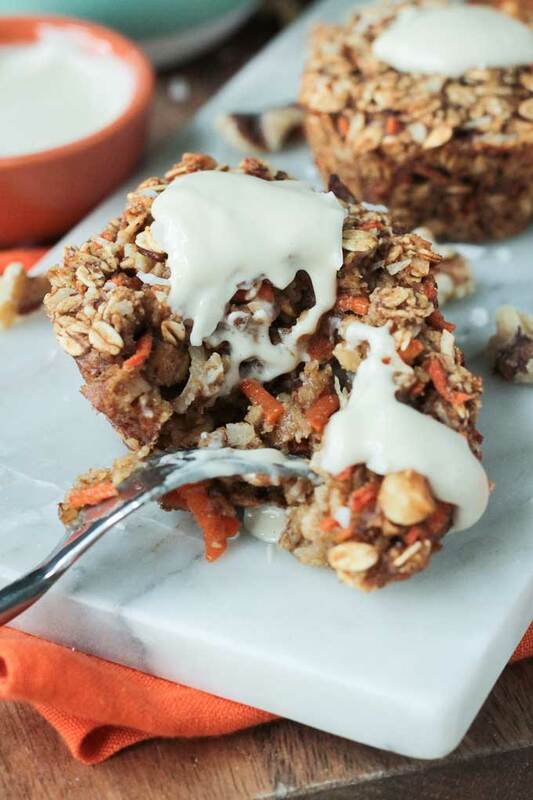 This Carrot Cake Baked Oatmeal is packed with veggies, healthy oats, and spices. 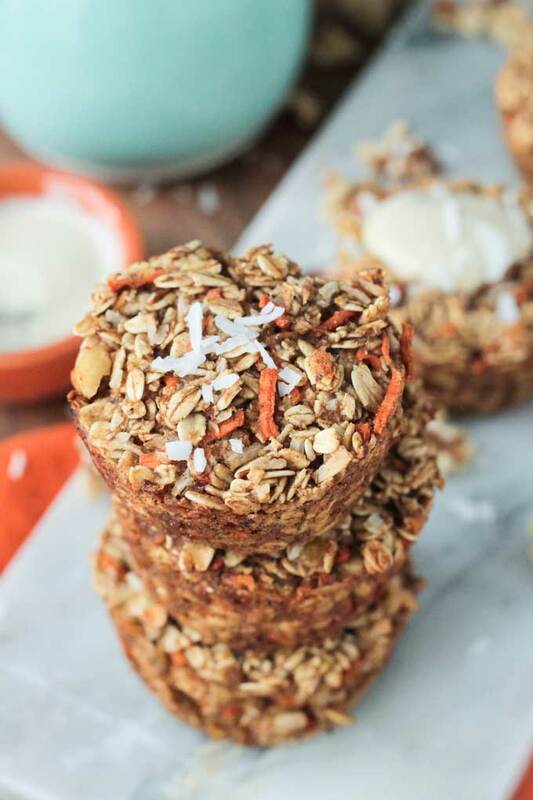 The taste is just like traditional carrot cake, but this recipe is totally worthy of dessert and healthy enough for breakfast. Judging from how fast my kids were scarfing these down, I’d say this is going into heavy rotation around here! Every time I create a new flavor of baked oatmeal, I deem it my new favorite. After my Gingerbread Baked Oatmeal though, I didn’t think it was possible to get any better. If you haven’t tried it, you need to! However, now that I’ve got this new carrot cake baked oatmeal, I think I may have gone and done it again – created a new favorite! Especially, if you add the thick and creamy sweet cashew cream cheese! I originally made the sweet cashew cream cheese to top my Carrot Cake Pancakes and it works just as perfectly here! Carrot cake and cream cheese just belong together, no? It’s kind of a requirement. 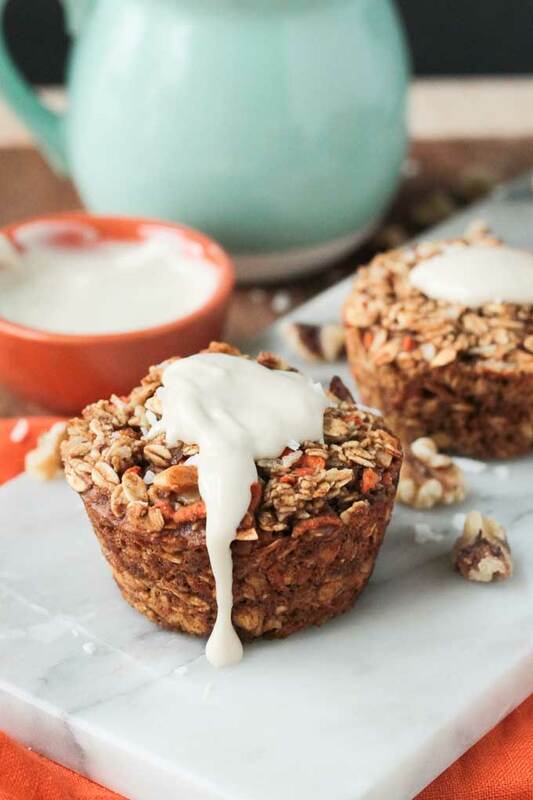 But, the sweet cream cheese is optional and these carrot cake baked oatmeal bites are incredibly delicious without it, as well. Breakfast is the most important meal of the day, but most of us don’t have enough time to sit down to eat an actual meal. Grabbing a bagel or donut is not going to do you any favors. You’ll be crashing fast in no time. That’s why I love baked oatmeal made in muffin tins. It makes for an easy, fiber-filled, grab-n-go breakfast. Perfect for snack time, too. Healthy oatmeal on the go? Yes! You need this in your life! The sweet cashew cream cheese might not be as portable, so leave that for when you have a few extra minutes to indulge at home. Trust me, it’s worth it to get up 2 minutes early for this combo! Just writing this post is making my mouth water. Luckily, I’ve got some left. They are hanging out in the fridge, but I’m thinking warming it for a few seconds then topping it with the cream cheese “frosting” is going to make an amazing evening treat. Do you make time to eat breakfast? What’s your go-to breakfast meal? I’d love to hear what you think of this Carrot Cake Baked Oatmeal once you try it. Please stop by to leave me a comment below with your feedback and star rating. You can also find me on social media. Be sure to tag @veggie_inspired and #veggieinspired so I don’t miss it! Carrot Cake Baked Oatmeal - sweet, moist and veggie loaded! Tastes just like carrot cake and even has the option of topping it with sweet cashew cream cheese!! In a medium mixing bowl, stir together the oats, coconut, flaxmeal, cinnamon, nutmeg, ginger, baking powder and salt and set aside. In another medium mixing bowl, whisk together the smashed banana, non-dairy milk, maple syrup, and vanilla. Pour the wet ingredients over the dry while stirring to coat. Mix thoroughly to ensure all the dry ingredients are moistened. Stir in the shredded carrots and walnuts and stir well. Spoon the mixture into the prepared muffin tins. Fill each one all the way to the top and pack it down with the back of a spoon. Bake for 20-25 minutes until the baked oatmeal starts to pull away from the sides easily. Let it cool in the pan on a wire rack for at least 10 minutes. Then, gently with knife or a spoon, lift them out of the tin and continue to let them cool on the wire rack. Serve them with Sweet Cashew Cream Cheese or a little extra maple syrup. Nutrition facts calculated per muffin and without the Sweet Cashew Cream. I’m allergic to bananas and I’m newly vegan what is a suitable swap? Hi, Jamie! Thanks for stoping by. The banana adds more sweetness, but you can leave it out if you can’t have them. I think they will still be plenty sweet enough. You can use unsweetened applesauce as a replacement though if you’d like. Applesauce is a little runnier than smashed banana, so you may need less plant milk if you go this route. Start with 3/4 cup, you can always add more if the mixture seems dry. I hope you enjoy them. Please come back and let me know how the turn out. And good luck on your vegan journey!! Feel free to stop by any time to ask questions! What do you suggest in place of the banana in this recipe–not a big fan of them. You don’t taste the banana. I added it for sweetness so I could cut back the sugar a bit. You could just leave it out though. If your mixture seems to dry, just add a splash more of the non-dairy milk. Enjoy! Well you know that I LOVE carrot cake. These are genius, Jenn. I can see why your kids loved them. And that sweet cashew cream looks amazing! My carrot cake baked oatmeal for breakfast and your carrot hazelnut cake for dessert. Sounds like the perfect day to me! 🙂 Thanks, Linda! 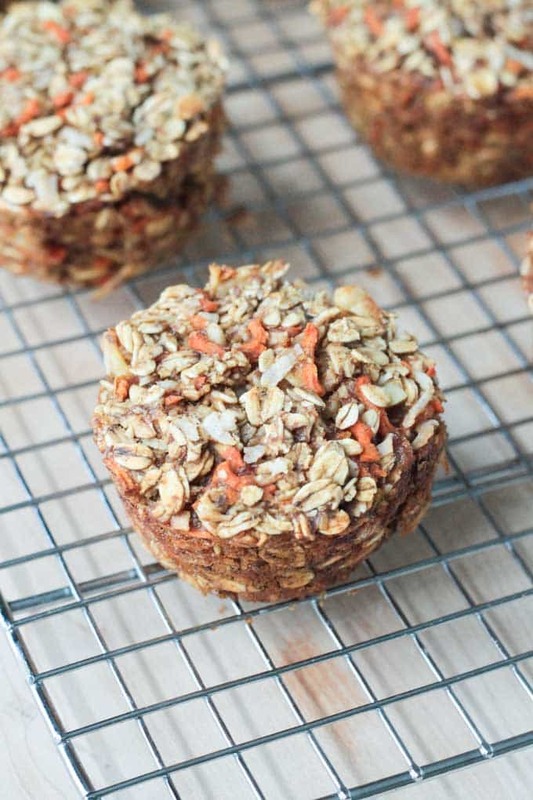 I love carrot cake anything but especially love the fact that these would make the BEST on-the-go breakfast snacks! Yes, super portable! No excuse for skipping breakfast anymore! (not that I ever did that – I wake up dreaming about breakfast!) 🙂 Thanks, Aimee! Mmm, healthy little carrot cakes for breakfast! With the cashew cream it’s just over the top. They look delicious! Thanks, Kat! I love the muffin tins for baked oatmeal. Perfectly portioned for the kids that way! WHAT?!?! This recipe just blew my mind! Absolutely brillant, Jenn! Pinning it! Oh, thank you so much, Vanessa! It truly does taste like carrot cake!! These look SO good girl! 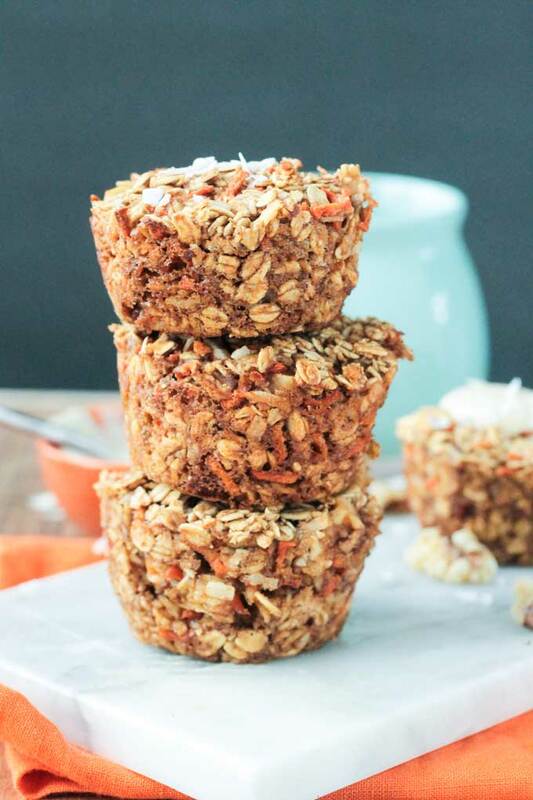 I love carrot cake and I love that you turned that into baked oatmeal, a great idea! I can imagine how heavenly your place smelled too. Great recipe! Yes…the smells! Divine! Thank you, Brandi! I was interested to see your recipe for this as I add carrot, banana and coconut to my Scottish oaty flapjacks which are chewy snacks, but I think these are more cakey. It’s interesting! I know how good they taste though, even though the texture is different as the flavours are the same. We particularly like to make them for our hillwalking or for my wee one’s lunchbox. Porridge oats are a staple here in Scotland, so they are included in lots of our dishes, both savoury and sweet as well as our morning porridge. Thanks, Jac! Those flapjacks looks so good!! You can tell they are really moist in the middle! Yum!! So fun how the same ingredients can give different results! Adorable little bites for breakfast! And I love carrot cake oatmeal so I’m sure they’re delicious! Perfect take and go. I love the idea of adding carrots to this oatmeal. It is great to hide vegetables in baked goods. I actually love combining veggies with cakes, muffins, breads etc. I need to try your baked oatmeal. Pinning! Anytime I can get more veggies into my kids is a win! Thanks, Ilona! You should try it…it’s really good! Definitely different than granola! These are soft and moist, but hold together just like a muffin. I hope you love them! Thanks, Mary! Oh great! I hope you love them, Christine. Please come back and let me know how they turn out! Who knew baked oatmeal would become my specialty? LOL! Thanks, Natalie! It’s all-day eats for sure! Thanks, Rebecca! Perfect for all day long!! Just found this comment in the spam folder, so sorry I didn’t reply sooner. 🙁 So weird.